WHEELING, WV - The Wheeling Nailers, proud ECHL affiliate of the Pittsburgh Penguins, have announced a transaction, which takes effect immediately. 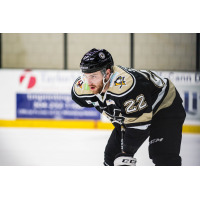 The Wilkes-Barre/Scranton Penguins have recalled defenseman Kevin Spinozzi. Spinozzi, 22, has been on an offensive tear for the Nailers, as he leads all ECHL defensemen with 11 goals and 28 points. Kevin has collected at least one point in seven consecutive contests, as well as 15 of the last 18 games, dating back to November 16th. Five of those 15 games have been multi-point performances for the blueliner, including a four-point outing at South Carolina on November 17th, and two-goal games against Indy on November 30th and against Norfolk on December 22nd. The Granby, Quebec native leads in two other categories for defensemen in the league, as his 97 shots on goal are the most, while his three game winning goals are tied for the top spot. This is Spinozzi's second professional season and second in the organization, as he is under AHL contract with the Penguins. Kevin has accumulated 13 goals, 22 assists, and 35 points in 54 career games with Wheeling and Wilkes-Barre/Scranton. The Nailers will conclude their five-game road stretch on Friday night against the Kalamazoo Wings at 7:30. Wheeling's next home game is New Year's Eve, which is also Star Wars Night at 6:05 against the Reading Royals. Fans can meet Star Wars characters, the Nailers will wear special jerseys, and there will be a surprise giveaway for the first 2,000 fans. Additionally, all tickets for the New Year's Eve game are just $8. Another exciting upcoming promotion is Nickelodeon Night Featuring SpongeBob & Patrick on January 12th. The Wheeling Nailers, considered one of the top things to do in Wheeling, West Virginia, provide affordable family entertainment for fans throughout the Ohio Valley. For information on season tickets, group tickets, flex plans, and more, call (304) 234-GOAL.